Too many cleaning and restoration contractors think “PPE” refers to a valve on their TM! Shame on them! Folks, listen carefully here. Providing (and insisting on using) Personal Protective Equipment (PPE) for your employees (and you too) is essential! Why? 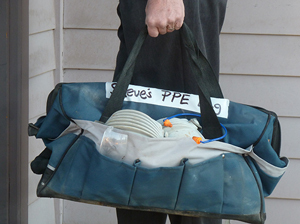 Make up a personal PPE bag for each employee to carry (and ‘own’) with them each day. Once each worker has their own PPE bag then perform an inventory check of your employee’s safety equipment at least once per month. NOW each employee will take this stuff seriously! Remember you must do more than provide and check up on PPE restocking. Your employees must also USE their safety equipment! So add in the question, “Proper use of appropriate PPE?” to your unannounced Job Site Inspection visits. Doing this will dramatically increase employee PPE usage. NOTE #1: I loved the concepts of “Shared Accountability”. I mean, why should I ALONE shoulder ALL of the load? Want more Shared Accountability ideas? Then download my free “How to Add Employee Accountability” Special Report HERE.